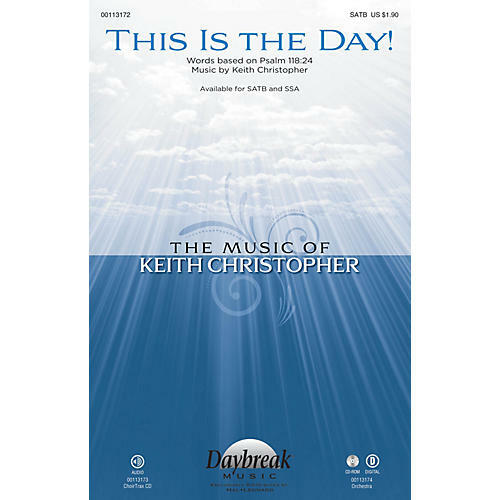 Uses: General, Thanksgiving Scripture: I Chronicles 16:8-11; Psalm 118 Full of textual and rhythmic energy, this new anthem by Keith Christopher is based on Psalm 118 and will provide an exciting choral anthem or call to worship. Available separately: SATB, ChoirTrax CD. Score and parts (fl 1-2, ob, cl 1-2, tpt 1-3, hn 1-2, tbn 1-2, tbn 3/tba, perc, timp, rhythm, vn 1-2, va, vc, db) available as a CD-ROM and as a digital download. Duration: ca. 2:30.